Afghanistan Political Map shared international boundaries with Tajikistan, Uzbekistan, Turkmenistan, Islamic Republic of Iran and Pakistan. History of Afghanistan map is very old. The capital of Afghanistan is Kabul, located at east Afghanistan. Kabul state share its national boundaries with Panjsher, Laghman, Nangarhar, Logar, Wardak and Parwan. Political map of Afghanistan shows all the states of Afghanistan, some of the states are famous enough and known to world these are Kandhar, Hirat, Ghazni, Uruzgan, Zabul, Saripaul, Hilmand, Farah. 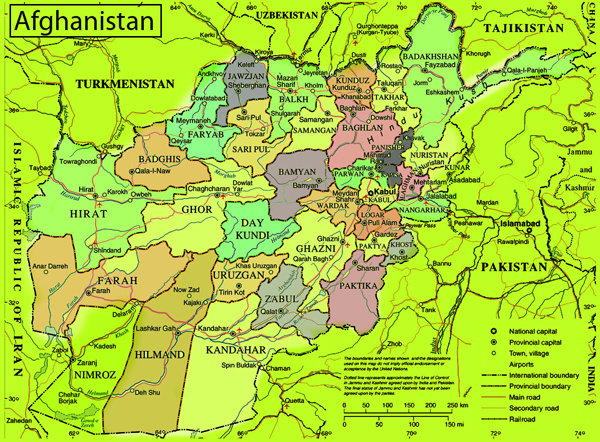 All other places in Afghanistan as follow Badakhshan, Takhar, Baghlan, Bamyan, Faryab, Jawzjan, Badghis, Ghor, Day Kundi, Nuristan, Nangarhar, Khost, Paktika, Kunduz, Balkh, Samangan.